Now before the employees start muzzling me for exposing the dirty little secret, it’s important to take a look at why they are spending so much time sitting at their desks without actually producing any relevant work for their employers. Given the current economic implosion, it’s easy to justify the feeling of burnout most employees are experiencing and the overwhelming inability to manage work / life balance. Nicole R. Matthews is Chief Experience Officer of RECESS by The Henley Company, a concierge firm specializing in events travel and lifestyle experiences. She set out to create a company that gives clients the gift of time to experience life. Living a life that incorporates RECESS is a commitment, not just a hope and a dream. Working with corporate clients, busy individuals and executive families, Nicole designs lifestyle management programs that create work / life balance. She champions the implementation of corporate concierge programs because she knows happy employees are productive employees. When she is not in the office, Nicole can be found with a Diet Coke in hand planning a trip to somewhere that requires her passport, kicking a soccer ball, drooling over fabulous accessories, scanning her social media sites (@henleyco / FB= Recess By The Henley Company) or belly laughing with her family. Follow her journey on her blog: www.henleyco.wordpress.com. Vacations 2011: Time Off Improves Productivity, Not Just Reducing Stress – ABC News. Clearly this article reminds us that “recess” does a body and mind very good! Taking time to decompress actually helps our bodies to restore and to lower stress levels. Are you overdue for a vacation? Even a short weekend getaway is enough to allow for the body to feel restored and the mind to rest! Next time the bell rings for recess, don’t ignore it! Instead go running out to the playground with full force! Your mind and body will thank you! As we have been working to rebrand, we have been looking at lots of images related to recess. I love what Schwinn has done with their campaign! Totally takes you back to riding your first bike – remember the freedom, the belly laughs and how your imagination soared with each push of the peddle? That’s exactly what RECESS by The Henley Company is all about! Kudos to Schwinn for helping us to stroll back down memory lane!! 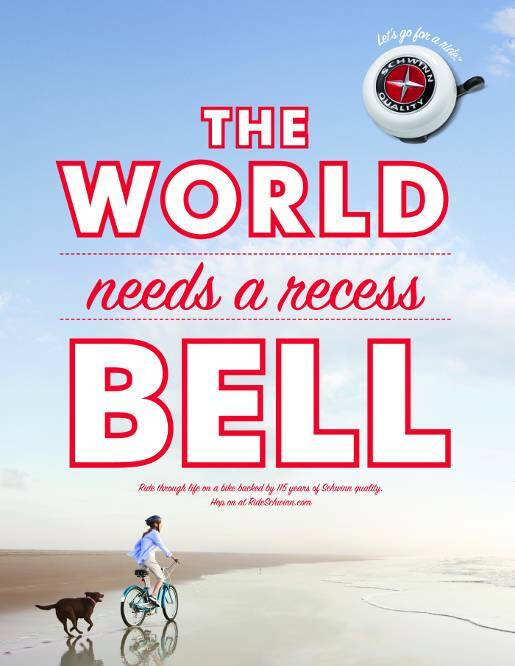 Schwinn Magical Bell | The Inspiration Room. February Family Experience – You are Invited! There is so much to see, explore and do at the San Diego Botanic Garden! We will enjoy Garden Bingo, a scavenger hunt that will take little explorers all around the Garden. Our families will be able to express themselves with paint, clay and help to create a mural for the Garden art program. Children can pot plants, climb in a tree house and play with boats floating in the stream. Check out and enjoy the beauty of the Butterfly Bed & Breakfast – a new enclosure for caterpillars to eat, rest, and transform into butterflies-all the stages of butterfly metamorphosis. For those really looking to explore, you could help Lucille the Lizard find her friend Leonard, who is hiding somewhere in the Garden! Explore four miles of garden trails, enjoy restful vistas, flowering trees, majestic palms, and the nation’s largest bamboo collection. Thanks to our mild climate, plants from all over the world thrive here. Our diverse topography provides a variety of microclimates giving the visitor a sensation of going from a desert environment to a tropical rainforest, all within 37 acres. The Hamilton Children’s Garden, is the largest interactive children’s garden on the West Coast. Admission includes a picnic lunch at the Hamilton Children’s Garden. HRH Prince William of Wales & Ms. Catherine Middleton. “A Celebration of the Royal Wedding” is a once-in-a-lifetime experience to celebrate the Royal Wedding of HRH Prince William of Wales and Ms. Catherine Middleton. For most American’s to enjoy a Royal Wedding they must get up in the middle of the night and watch the coverage on TV. It is how an entire generation of young women recount the wedding of HRH Prince Charles and Ms. Diana Spencer. Forget setting your alarm this time around! Grab your girlfriends, your sisters and your Mom and hop a plane to London so you can enjoy all of the pomp and circumstance first hand for the Royal Wedding of Wills & Kate! You can be witness to the dawn of the modern monarchy and celebrate the love story of a dynamic young couple. Enjoy 10 days/9 nights in London, England for a unique Royal themed tour and celebration of the Royal Wedding! This exclusive trip will be limited to 25 guests. Airfare will be priced individually. To secure your place, a deposit of $1000 is due by April 1, 2011. Note: The tour does not include access to the Royal Wedding at Westminster Abbey nor does it guarantee that you will meet any members of the Royal Family. The tour includes the ability to participate in the public festivities being arranged around the Royal Wedding, in addition to the private tours as described above. We are just days away from announcing the final itinerary for our Royal Wedding Experience. All of the key pieces are falling into place and we are super excited with all of the planning! Our interest list is filling up fast so make sure you get yourself on the list ASAP! The tour will only accommodate 25 attendees in an attempt to keep it super unique and intimate. We look forward to joining you in London! !